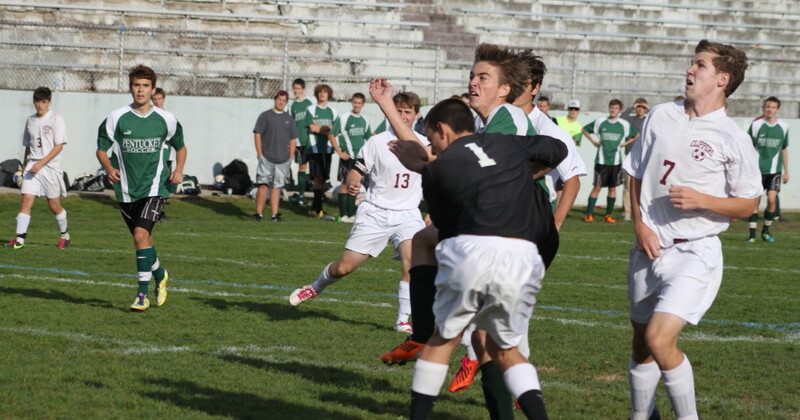 Matt Farrell scores the first goal of the game on a header past NHS goalie Matt Canning. (Newburyport) A fast start gave Pentucket the ALS Cup and a 3-2 win over Newburyport in boys soccer at World War Stadium on a warm Tuesday afternoon. Pentucket (12-2-2) had goals by Matt Farrell and Zack Chapman in the first eight minutes and led at the half, 2-0. Tom Graham lines up his 12th goal of the season early in the second half. Tom Graham put the Clippers within one (2-1) early in the second half but Matt Farrell converted a long run down the left sidelines five minutes later to restore the two-goal edge. Jordy Steelman tallied the second NHS score in the last minute but there wasn’t time for Newburyport to get a shot at the equalizer. 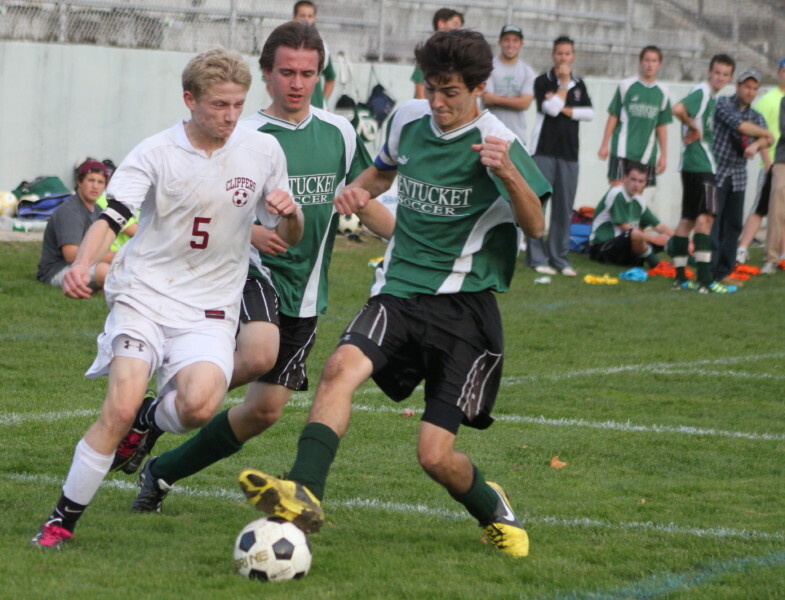 Newburyport (9-5-2) had lost the previous meeting with Pentucket, 3-1, on September 21st. 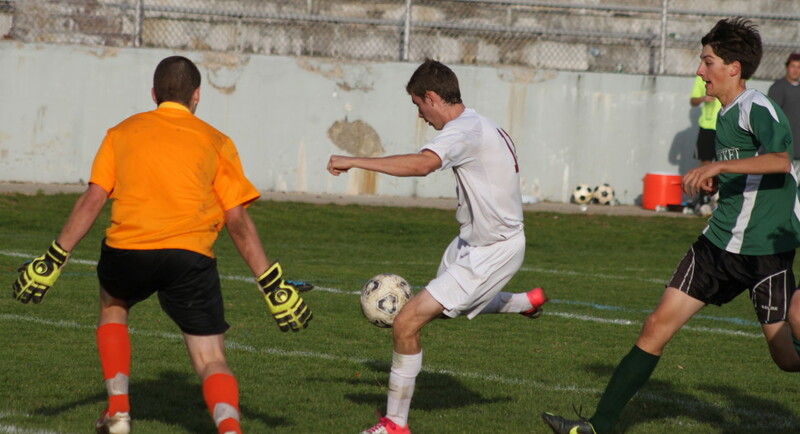 Less than two minutes in the Cape Ann League’s top goal scorer (Matt Farrell) headed a shot past NHS goalie Matt Canning. The Clippers defense reacted slowly to a ball in their space and Matt Farrell took advantage. NHS coach Shawn Bleau called an immediate timeout and issued a full-blown wakeup call to his Clippers. Unfortunately, six minutes later there was more defensive trouble in front of the Clipper net. Sachem Zack Chapman was able to get a clean straightaway look at a rebound of Matt Farrell’s shot to give Pentucket a 2-0 lead. The rest of the 40-minute half was almost all Newburyport. By my unofficial count, the Clippers had eighteen shots either on net or near the net. Two of the best were heading setups by Adam Traxler to King Shema and Jordy Steelman. Trevor Collins hit the crossbar with this late first-half shot. Right at the end of the half Pentucket’s Trevor Collins broke in from the left but his clean look grazed off the crossbar. 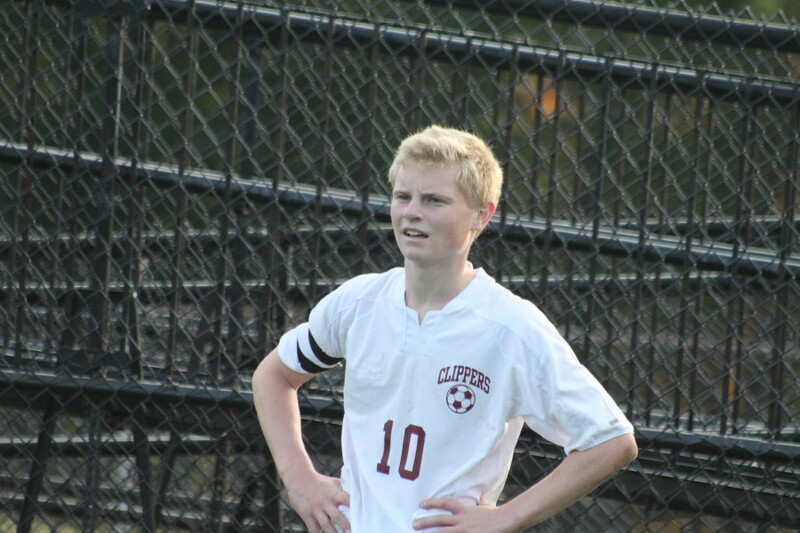 Newburyport’s first goal came off of a terrific setup by junior Adam Traxler four minutes into the second half. Adam drew a crowd (as he usually does) at midfield and was able to lob a pass over the defense. Teammate Tom Graham registered his 12th goal after collecting the pass and firing a low shot past Pentucket’s second half goalie, Cody Sedler. Logan Sherwood was in net for the first half. Matt Farrell ruined Newburyport’s hopes of getting any closer five minutes later with a strong individual effort. The talented senior made nearly a half-field run down the left side and beat goalie Matt Canning inside the strong-side post. 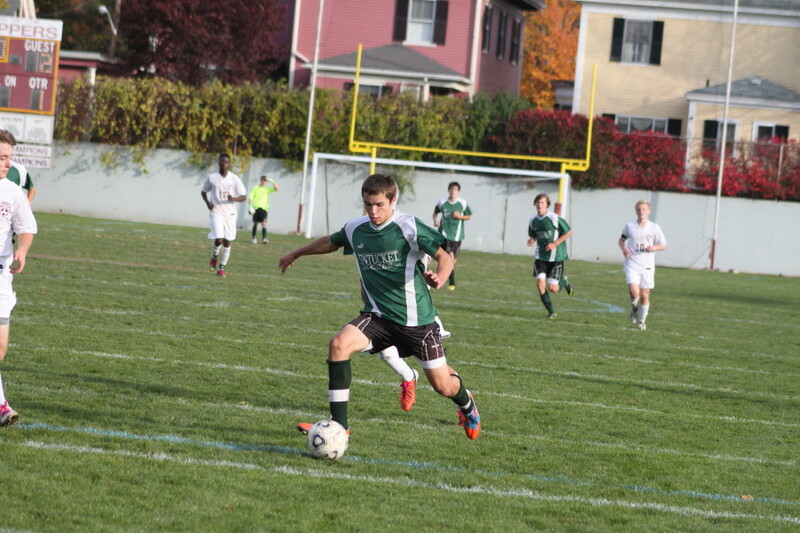 Matt Farrell is the Cape Ann League’s top goal scorer now with fifteen for the season. 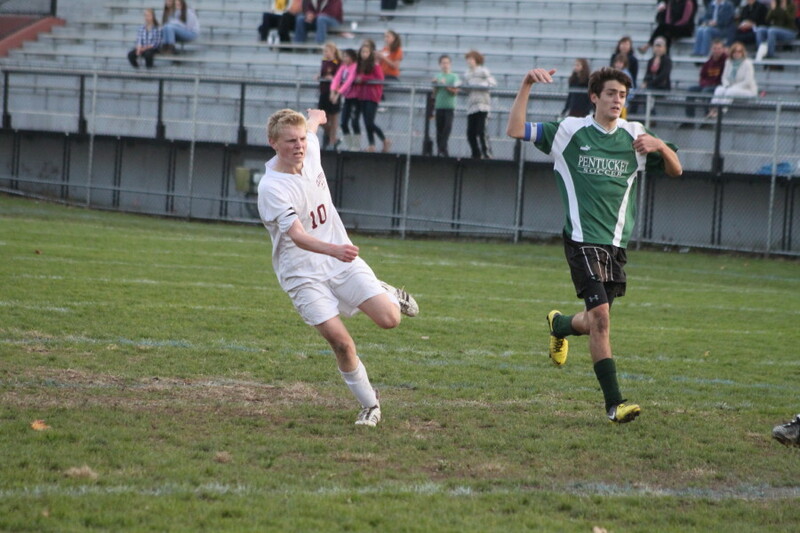 Both teams had corner kicks (4 for Pentucket/ 3 for Newburyport) the rest of the way. 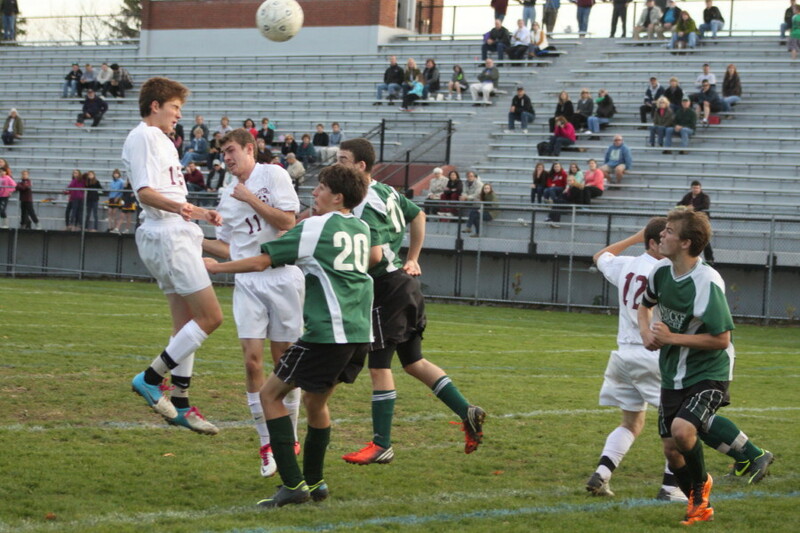 Newburyport brought goalie Matt Canning up to do a throw-in during the last five minutes which went wide. Jordy Steelman (10) shoots and scores as defender Ben Craig races to catch up. In the last minute Jordy Steelman dribbled down the middle by several Pentucket defenders for a score to tighten things to 3-2. 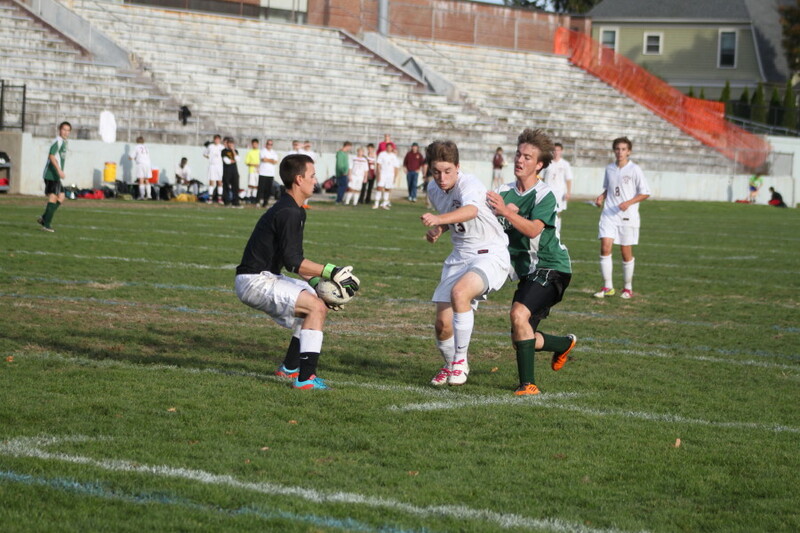 Pentucket was able to dominate the rest of the time as Matt Farrell hit the crossbar close to the end of the game. Matt Farrell ended with two goals and an assist. He also was given plenty of rest by PHS coach Chris Langlois. By my count he was on the sidelines for eighteen minutes. That number gave me an idea of Pentucket’s depth. Matt may be the leading scorer in the CAL but the most dangerous player in the league could well be Adam Traxler. He put serious pressure on the PHS defense numerous times. His assist on Tom Graham’s goal was one of the best you’ll see. 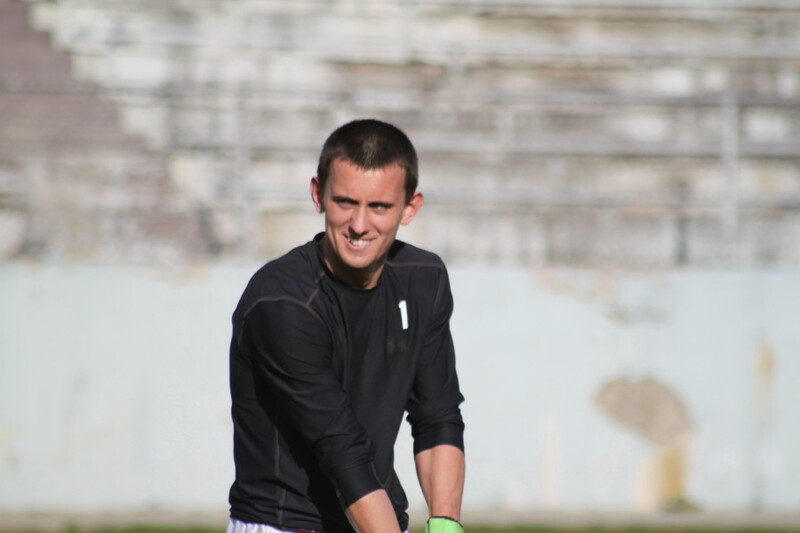 The ALS Cup is a fundraiser for former NHS student Brent Paulhus who has the disease. Matt Cote (15) heads a shot toward the Pentucket goal in the second half. Both Pentucket and Newburyport have the points to qualify for the postseason tournament. Both have two regular season games left this week. Next for Pentucket is a road game with Hamilton-Wenham on Thursday. Newburyport gets Masconomet at home on the same day. World War Stadium is a great place to watch a game at. The spectators are close to the field with an elevated view. The only issue appears to be the limited space on the team sidelines. Teams that have uniforms with numbers only on the back (I’m looking at you, Pentucket!) have no idea how difficult that makes it to identify players in pictures. 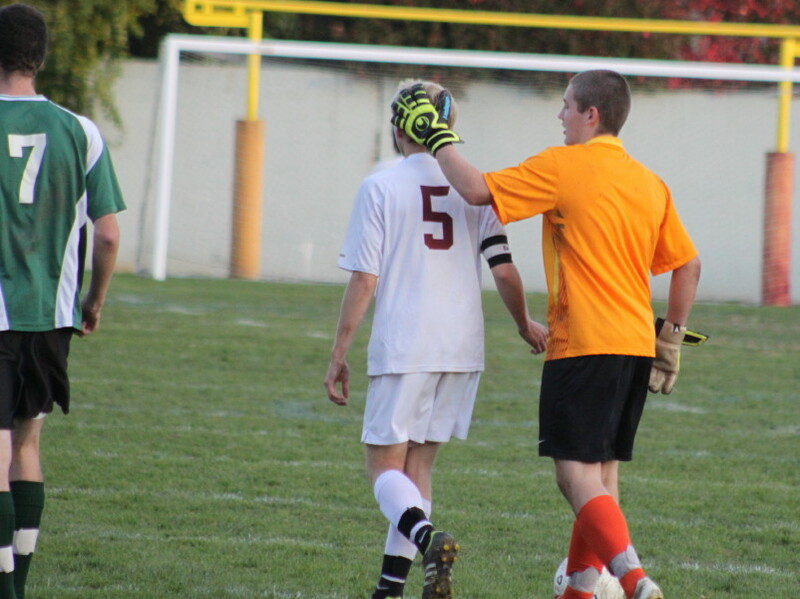 Pentucket goalie Cody Sedler congratulates Adam Traxler afterwards. Alex Salah shields Matt Farrell away from goalie Matt Canning.